For over 130 years, scientific sleuths have been inspecting hairs under microscopes. Late in 2012, the FBI, the Innocence Project, and the National Association of Criminal Defense Lawyers joined forces to review thousands of microscopic hair comparisons performed by FBI examiners over several of those decades. The results have been astounding. Based on the first few hundred cases in which hairs were said to match, it appears that examiners “exceeded the limits of science” in over 90% of their reports or testimony. The disclosure of this statistic has led to charges that the FBI “faked an entire field of forensic science,” placed “pseudoscience in the witness box,” and palmed off “virtually worthless” and “scientifically indefensible” evidence as scientific truth. This essay questions these interpretations of the 90% figure. 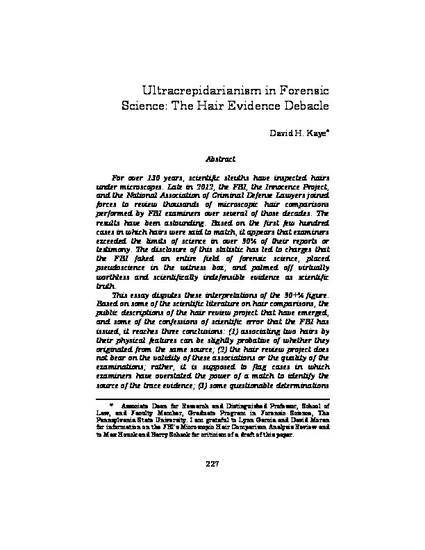 On the basis of some of the scientific literature on hair comparisons, the public descriptions of the hair review project that have emerged, and some of the confessions of scientific error that the FBI has issued, it reaches three conclusions: (1) associating two hairs by their physical features can be at least slightly probative of whether they originated from the same source; (2) the hair review project does not bear on the validity of these associations or the quality of the examinations; rather, it is supposed to flag cases in which examiners have overstated the power of a match to identify the source of the trace evidence; (3) some questionable determinations have been issued, the 90% figure may not be a valid and reliable measure of overclaiming. To promote more complete understanding of the nature and extent of overclaiming, the review process should be made more transparent and the materials it produces should be readily available for researchers and the public to study. New state or local evidence reviews should be designed accordingly. Finally, in all areas of forensic science, clear standards for presenting identification evidence without overclaiming should be devised, and training and monitoring programs should be implemented to ensure that laboratory personnel and prosecutors adhere to them.